Good morning my lovely Polished Peeps! How are you all doing on this cold, chilly Monday? We were hit head on by Winter Storm Harper so I've spent the last 48 hours at home. Went outside, shoveled, baked some cookies, made some dinners, slept a whole heck of a lot. It was a much needed 48 hours of decompressing and quiet time. My plan was to share yet another snowflake manicure with you all today, but since I spent the last 48 hours being a bum, that meant I spent those 48 hours with naked nails. 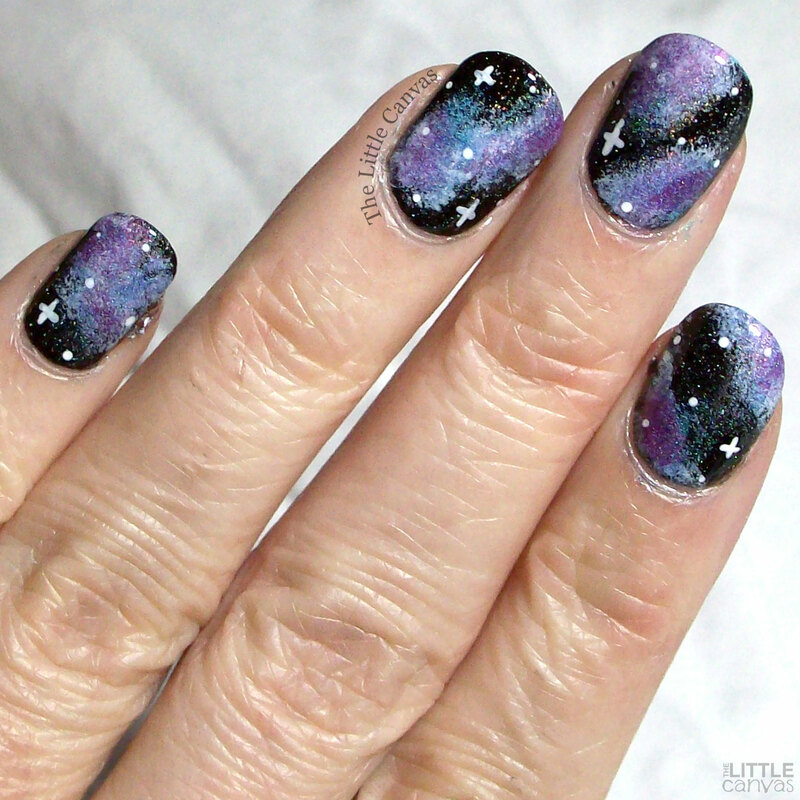 So, I have to break my snowflake streak and share with you a galaxy manicure. It's actually a fitting manicure for today seeing as there was that blood moon and a total lunar eclipse last night. 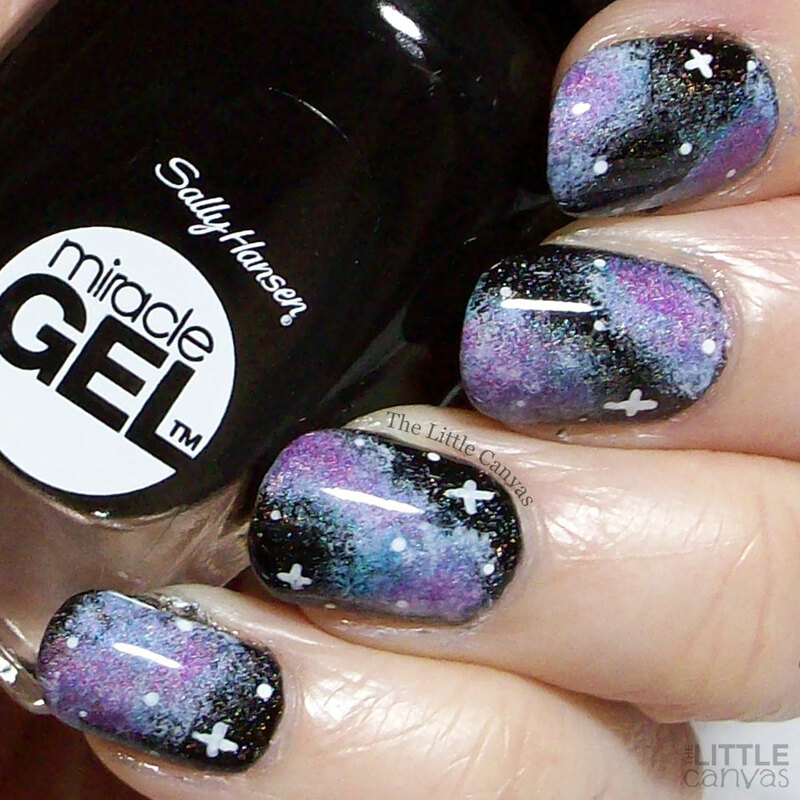 Guyssssss, this galaxy manicure is by far one of my favorite. I wish you could see how it sparkled thanks to the amazing holographic polishes from the China Glaze OMGFlashback collection. Then when I topped it with Northern Lights, it was a holographic, sparkly wonder. Truly looked like a galaxy! To get the look I started off with my new favorite black polish, Sally Hansen Onyx-pected from the Miracle Gel line. Two coats and full coverage. I then went with a white polish and sponged the base of the nebula. I then took multiple holos and filled in the white. I then added a top coat of INM Northern Lights to blend it all together. When that was dry, I added the little stars, and another top coat, and bam Galaxies. What do you think? Fan of this galaxy manicure? Did anyone see the super blood moon?